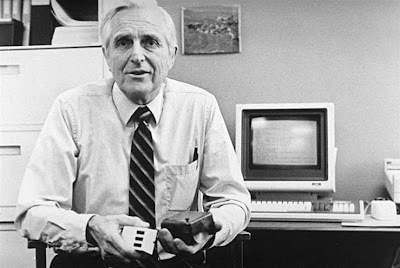 Unless you're reading this on a mobile device (and even that owes a lot to him) you're enjoying this blog and practically everything else on the Internet because of this man: Douglas Engelbart. While working at SRI in the 1960s, Engelbart was struck with the idea of humans interacting with computers by manipulating on the screen with an intuitive interface. He called his invention the "x-y position indicator". The first model was carved from a block of wood with wheels, a push-button and a connecting cord. Douglas Engelbart had created the mouse. And he didn't stop there. By the time he left SRI in 1977, he had helped develop such now-common technologies as "display editing, online processing, linking and in-file object addressing, use of multiple windows, hypermedia, and context-sensitive help". 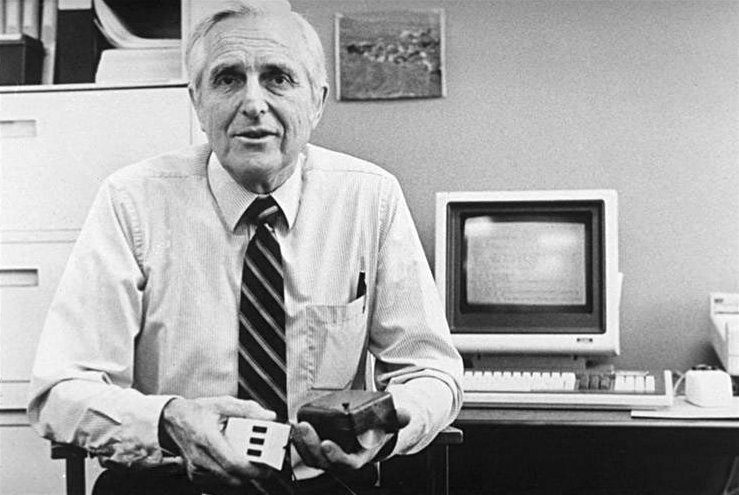 The sad word is coming out of Atherton, California tonight that Douglas Engelbart - pioneering engineer and visionary whose invention let the rest of us discover the power of computers - has passed away at the age of 88.